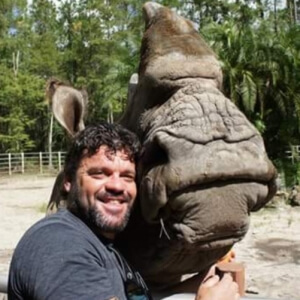 Donovan Smith, co-owner of the NGALA Wildlife Preserve near Naples, has cared for Walter the rhino since the animal was about a year old. So when rapidly-moving wildfire threatened the life of Walter and a few other animals who couldn’t be evacuated Friday, Smith stayed behind. “I just wanted to save my animals and keep the firemen safe,” he said Monday in the Regional Burn Center at Tampa General Hospital. Smith said he received most of his burns traveling through the preserve on a four-wheeler to reach Walter’s enclosure. The fire had closed in quickly, and the heat was greater than he anticipated. Despite his injuries, Smith found Walter and stayed with him until the fire was at bay. The 5,000-pound rhino, who’s about 8 years old, was initially agitated during the fire, Smith said. “He heard my voice and he started calming down,” Smith said. Firefighters brought a fire truck into the pen to spray the area and keep Walter safe. It’s not surprising the animals were upset, Smith said, given the fire and the noisy trucks and helicopters fighting the fire, which spread over 7,000 acres. Smith was transferred to Tampa General, a verified burn center, from a Naples hospital. He expects to be hospitalized here for about a week and to make a full recovery. “It would have been a tragedy to lose Walter,” he said. “I’m really humbled and just blown away by the support” he has received since the fire. The fire destroyed at least nine homes, but nobody else was injured. All of the preserve’s 45 animals – which also include a giraffe, a Florida panther, and a leopard – made it through the fire safely. Most of the animals were born in captivity or cannot be released into the wild for various reasons, Smith said. Photos courtesy of Donovan Smith.